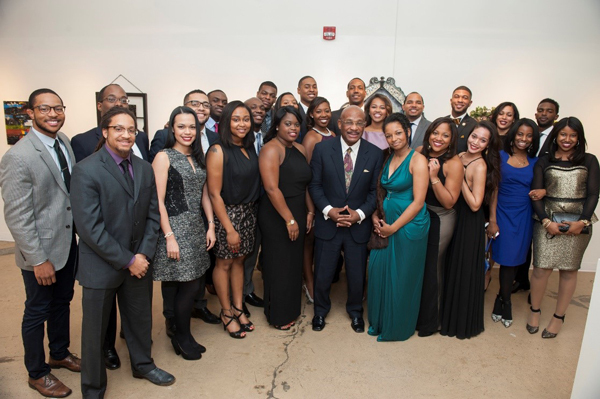 WINSTON-SALEM, NC - Trial Attorney Willie Gary was featured as the keynote speaker at the Wake Forest Black Law Students Association’s 31st Annual Scholarship Banquet on Friday, Feb. 12, at the Milton Rhodes Center for the Arts. According to Ashlee Johnson, BLSA member and event chair, his speech was called “Fulfilling the Dream,” and was an eloquent reimagining of Dr. Martin Luther King, Jr.’s “I have a dream” speech of 1963. Mr. Gary reflected on what people are doing today to fulfill Dr. King’s dream, especially in the vein of on-campus movements, student protests, and presidential elections. The speech finished with a rousing ovation by the crowd, giving testament to Mr. Gary’s efficacy as an orator in the courtroom, as well as his ability to inspire young professionals of the future.